Below are the steps on how to add our calendar on your calendar. Copy the ICAL Link above. 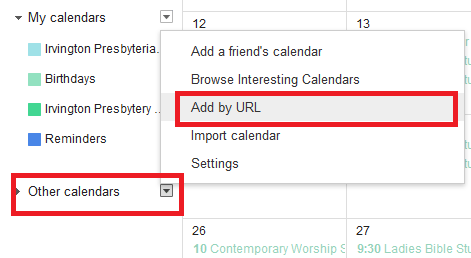 Go to your calendar and click the “Other Calendars” arrow and the “Add by URL” button. Paste the ICAL link in the URL textbox as shown below. Click the “ADD Calendar” button to sync our calendar in to your calendar.